Yesterday The Document Foundation (TDF) announced the release of LibreOffice 6.2, a significant major release of the free and open source office suite which features a radical new approach to the user interface – based on the MUFFIN concept – and provides user experience options to meet all users’ preferences. The NotebookBar is available in Tabbed, Grouped and Contextual versions. Each one has a different approach to the menu layout and complements the traditional Toolbars and Sidebar. The Tabbed variant aims to provide a familiar interface for users coming from suites such as MS Office and is supposed to be used primarily without the sidebar, while the Grouped one allows to access “first-level” functions with one click and “second-level” functions with a maximum of two clicks. The help system offers faster filtering of index keywords, highlighting search terms as they are typed and displaying results based on the selected module. Change tracking performances have been dramatically improved, especially in large documents. In Writer, it is now possible to copy spreadsheet data into tables instead of just inserting them as objects. In Calc it is now possible to do multivariate regression analysis using the regression tool. In addition, many more statistical measures are now available in the analysis output and the new REGEX function has been added, to match text against a regular expression and optionally replace it. In Impress and Draw the motion path of animations can now be modified by dragging its control points. In addition, a couple of text-related drawing styles have been added, as well as a Format Table submenu in Draw. LibreOffice Online, the cloud-based version of the suite, includes many improvements too. On mobile devices, the user interface has been simplified, with better responsiveness and updates to the on-screen keyboard. As with every major and minor release of LibreOffice, interoperability with proprietary file formats has also been improved for better compatibility with Office documents, including old versions which have been dropped by Microsoft. The focus has been on charts, animations and document security features. To assist with interoperability, LibreOffice 6.2 is built with document conversion libraries from the Document Liberation Project. LibreOffice 6.2’s new features have been developed by a large community of contributors: 74% of commits are from developers employed by companies on the TDF’s the Advisory Board, such as Collabora, Red Hat and CIB and by other contributors such as the City of Munich. Individual volunteers account for 26% of commits. In addition, there is a global community of individual volunteers taking care of quality assurance, software localization, user interface design and user experience, editing the help pages and documentation. The Document Foundation has also released LibreOffice 6.1.5, a more mature version which includes some months of back-ported fixes and is better suited for commercial deployments, where features are less important as individual productivity is the main objective. Companies wishing to deploy LibreOffice are advised to seek assistance for such matters as software support, migrations and training from qualified professionals. LibreOffice 6.2 and LibreOffice 6.1.5 are now available for immediate download. Builds of the latest LibreOffice Online source code are also available, released as Docker images. LibreOffice Online is fundamentally a server service and should be installed and configured by adding cloud storage and an SSL certificate. It might be considered an enabling technology for the cloud services offered by ISPs or the private cloud of enterprises and large organisations. LibreOffice users, free software advocates and community members are encouraged to support The Document Foundation with a donation. Let’s start with a trio of questions. 1. Why should governments develop free software*? 2. Where is free software already generating benefits in the public sector? 3. What are free software business models? Answers to the above questions and practical guidelines are given in the new expert policy brochure published today by the Free Software Foundation Europe. 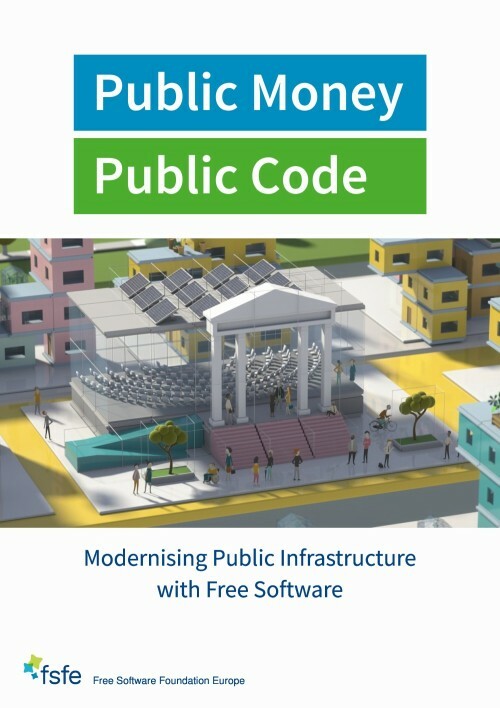 Entitled “Public Money Public Code – Modernising Public Infrastructure with Free Software“, the brochure aims to answer decision-takers’ questions about the benefits of using and developing free software for public sector organisations. To help understand the important role that public sector procurement plays in this, the brochure presents an overview of EU free software projects and policies, uncovering legislation on software procurement. The FSFE will use this brochure in the forthcoming European Parliament elections to inform potential MEPs how to speed up the distribution and development of free software in the public sector and putting appropriate legislation in place. The brochure evaluates the modernisation of public infrastructure by using free software from the perspectives of academia, law, business and government. Expert articles, reports and interviews help readers to understand the opportunities for free software in the public sector. Practical guidance is provided for decision-makers to move forward and start modernising public infrastructure with free software. Initial steps for making free software licenses the default in publicly-financed IT projects are outlined in the brochure. Other topics include competition and potential vendor lock-in, security, democracy, “smart cities” and other important contemporary topics. The language and examples used have been specifically chosen for readers interested in politics and public administrations. The brochure features leading experts from various ICT areas. Amongst others, these include Francesca Bria, Chief of Technology and Digital Innovation Officer (CTIO) for the Barcelona City Council, Prof. Dr. Simon Schlauri, author of a detailed legal analysis on the benefits of free software for the Swiss canton of Bern, Cedric Thomas, CEO of OW2, Matthias Stürmer, head of the Research Center for Digital Sustainability at the University of Bern and Basanta Thapa from the Competence Center for Public IT (ÖFIT) within the Fraunhofer Institute for Open Communication Systems. The brochure is available in both digital and printed formats, and is published under a CC BY-SA 4.0 licence and I’ll be sending a copy of the PDF to my MP for her information. * = In this context the definition of free software is free as in freedom, not beer. The first bug hunting session for the forthcoming LibreOffice 6.1 release will be held on Friday, 27th April, The Document Foundation blog has announced. LibreOffice 6.1, the next point release of the free and open source office suite which emphasises the use of open standards, such as the Open Document Format (ODF), is due to be made available in August this year. To help ready the software for its release date, the LibreOffice Quality Assurance community is organising an initial bug hunting session this Friday to find, report and triage bugs. Details of the event can be found on the dedicated wiki page. This first Bug Hunting Session will involve the first Alpha version of LibreOffice 6.1, which will be available on the pre-releases server on the day of the event. Builds will be available for Linux (DEB and RPM package formats), macOS and Windows. Users will be able to run the Alpha release in parallel with their production version – thus enabling testing without affecting users’ existing stable installations. Mentors will be available on April 27th 2018 from 8.00 a.m. UTC to 8.00 p.m. UTC for questions or help in the IRC channel: #libreoffice-qa (connect via webchat) and its Telegram bridge. During the day there will be 2 dedicated sessions focussed on two of the tenders implemented in LibreOffice 6.1: the first between 10.00 a.m. UTC and 12.00 a.m. UTC to test improvements in image handling; and the second to test the HSQLDB import filter for firebird between 2.00 p.m. UTC and 4.00 p.m. UTC. According to the release plan, the LibreOffice 6.1 office suite will enter beta stages of development at the end May, with a second beta planned for mid-June. After that, there should be about three RCs released between the first week of July and the first week of August with the final release being available in mid-August. The City of Dortmund wants to examine the potential of free software and open standards for the city council until the end of 2019, German IT news website heise reports. Munich’s decision last year to abandon open source is not the final word in open source matters in German local authorities. Dortmund’s city council has decided to investigate the potential of free and open source software “systematically” in the field of municipal ICT. 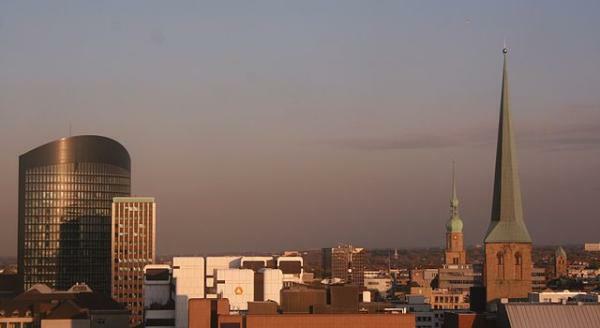 Dortmund panorama. Image courtesy of Wikimedia Commons. A free software working group has been established and will work together with the council’s personnel board and Do-FOSS citizens’ action group in developing a free software strategy which should be produced by the end of 2019. Dortmund is thus an open source pioneer in North Rhine-Westphalia (NRW). The NRW E-government Law stipulates that open and standardised file formats shall be used by public authorities for sending files to citizens and companies. Amongst other things, efforts will be made to reduce reliance on suppliers and become more flexible in software use. The aspect of transparency and “Green IT” are also pre-requisites for the strategy. The German Federal Environment Office has determined that free software could save resources due to lower hardware requirements and longer life cycles. Moreover, a more flexible choice of suppliers could also improve local authorities’ negotiating position with proprietary software vendors. Do-FOSS, which has been calling for years for a switch in public sector procurement towards free software and open standards, is hailing the decision as a “milestone“. In addition, a draft for the introduction of “Open Data Dortmund” is to be submitted to the local authority by next summer. DO-FOSS is now hoping that a comprehensive approach will now be developed within the council for the free and open source IT. Back in January Mayor Ullrich Sierau and the personnel board signed the Digital Dortmund 2018-2030 Charter (PDF, German), in which the use of open standards was agreed for the council’s ICT. On Thursday, The Document Foundation (TDF), the organisation behind the free and open source Libreoffice productivity suite, announced the release of LibreOffice 6.0.3, the third minor release of the LibreOffice 6 family. Compared to the previous release, LibreOffice 6.0.3 around 70 bug and regression fixes. LibreOffice 6.0.3 represents the bleeding edge in terms of features and as such is targeted at early adopters, tech-savvy and power users, while LibreOffice 5.4.6 – provided as an alternative download option – is targeted at more conservative mainstream users and enterprise deployments. LibreOffice 6.0.3 is immediately available for download for all major platforms – Linux, Mac OSX and Windows – at the following link: https://www.libreoffice.org/download/download/. As per usual, technical details about LibreOffice 6.0.3 bug and regression fixes can be found in the change logs for RC1 and RC2. TDF advises mainstream users and companies to deploy LibreOffice with the support of certified developers, migrators and trainers. Several companies on TDF’s Advisory Board provide either value-added LTS versions of LibreOffice or consultancy services for migration and training. LibreOffice users, free software advocates and community members can support The Document Foundation with a donation. Donations help TDF to maintain its infrastructure, share knowledge and fund attendance at events like LibreOffice Conference, which this year takes place in Tirana. Today The Document Foundation (TDF) announced the availability of LibreOffice 5.4.6, the sixth minor release of LibreOffice 5.4 family which is currently targeted for deployment in an enterprise or corporate environment and conservative users. 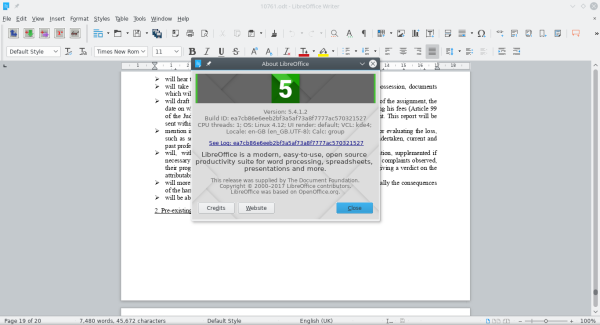 LibreOffice 5.4.6 is available for immediate download. LibreOffice 5.4.6 includes almost 60 bug and regression fixes. Technical details about the release can be found in the RC1 and RC2 change logs. Several companies sitting in TDF’s Advisory Board provide either value-added LTS versions of LibreOffice or consultancy services for migration and training. Yesterday The Document Foundation (TDF) announced the release of LibreOffice 5.4.3, the third minor release of LibreOffice 5.4 family, which includes some 50 bug and regression fixes. LibreOffice 5.4.3 represents this free and open source office suite’s very latest in terms of features and is therefore targeted at technology enthusiasts and early adopters. TDF recommends that more conservative users and companies deploy LibreOffice 5.3.7, as well as seeking support from certified professionals. LibreOffice 5.4.3 is available for immediate download for all major operating systems – Linux, MacOS and Windows. Your ‘umble scribe has now downloaded and installed the latest release and it works beautifully. LibreOffice users, free software advocates and community members can support The Document Foundation with a donation. Donations help TDF to maintain its infrastructure, share knowledge and organise events such as the Month of LibreOffice, which has last week and will be active until the end of November (https://blog.documentfoundation.org/). Finally, several companies sitting in TDF’s Advisory Board provide either value-added long-term support (LTS) versions of LibreOffice or consultancy services for migrations and training. Yesterday The Document Foundation (TDF) announced the release of LibreOffice 5.4.2, the second minor release of the LibreOffice 5.4 family. LibreOffice 5.4.2 continues to represent the bleeding edge in terms of features and as such is targeted at technology enthusiasts and early adopters. TDF suggests that more conservative users and businesses deploy LibreOffice 5.3.6 with the support of certified professionals. LibreOffice 5.4.2 includes approximately 100 bug and regression fixes. Technical details about the release can be found in the RC1 (release candidate) and RC2 change logs. LibreOffice 5.4.2 is available for download for all major platforms (Linux, MacOS and Windows). LibreOffice users, free software advocates and community members are invited to support the work of The Document Foundation with a donation. Donations help TDF to maintain its infrastructure, share knowledge, and organise events such as the LibreOffice Conference, with the next one taking place next week in Rome. LibreOffice was the runaway winner in a survey of Ubuntu Linux users for desktop productivity software with 85.52% of the votes. The closest competitors were Google Docs with 4.29%, WPS Office with 3.22% and Apache OpenOffice with 1.96%, while all other office suites accounted for less than 1% responses. “Even with Windows shipping Ubuntu/Bash on their desktop, even with Google shipping Chromebooks with Linux+Chrome pre-installed, even with Mac OS running away with a premium segment of the desktop market, even with Android phones and tablets, there are many tens of millions of passionate Ubuntu desktop users who are eager to have their voices heard! And LibreOffice continues to be THE enabler of local office productivity on the Ubuntu Desktop,” says Dustin Kirkland, Vice-President of Product Development for Ubuntu at Canonical. The results of the Ubuntu 18.04 LTS Default Desktop Applications Survey were presented by Dustin Kirkland at the UbuCon Europe conference in Paris in September. Digital services provided and used by public sector organisations are the critical infrastructure of the 21st century. Central and local government agencies must ensure they have full control over systems at the core of our digital infrastructure to establish trustworthy systems. However, this is rarely the case due to restrictive proprietary software licences. Thirty-one organisations are today publishing an open letter in which they call for lawmakers to advance legislation requiring publicly financed software developed for the public sector be made available under a Free and Open Source Software licence, the Free Software Foundation Europe (FSFE) reports. The initial signatories include CCC, EDRi, Free Software Foundation Europe, KDE, Open Knowledge Foundation Germany, openSUSE, Open Source Business Alliance, Open SourceInitiative, The Document Foundation and Wikimedia Deutschland. All the signatories are asking individuals and other organisation to sign the open letter, which will be sent to candidates in the forthcoming German parliamentary election and, during the coming months, to other representatives of the EU and EU member states until the 2019 European Parliament elections. Public institutions spend millions of euros each year on the development of new bespoke software. The public sector’s procurement choices play a significant role in determining which companies are allowed to compete and what software is supported with taxpayers’ money. Public sector organisations often have problems sharing code with each other, even if they fully funded its development. In addition, sensitive personal data on citizens is at risk if there is no option for independent third parties to run audits or other security checks on the code. On the last day of August, The Document Foundation (TDF) announced two point releases for the popular LibreOffice productivity suite: LibreOffice 5.4.1 “Fresh”, the first minor release of the new LibreOffice 5.4 family; and LibreOffice 5.3.6 “Still”, the sixth release of the mature LibreOffice 5.3 family. LibreOffice 5.4.1 represents the bleeding edge in term of features, and as such is targeted at technology enthusiasts and early adopters, whereas LibreOffice 5.3.6 is targeted at more conservative users and enterprise deployments. As regards enterprise use, TDF suggests deploying LibreOffice 5.3.6 with support from certified professionals. Furthermore, many companies sitting on TDF’s Advisory Board also provide either value-added Long Term Supported versions of LibreOffice or consultancy services for migration to LibreOffice and training. LibreOffice 5.4.1 includes approximately 100 bug and regression fixes, along with document compatibility improvements. Technical details about the bug fixes can be found in the RC1 and RC2 change logs. LibreOffice 5.3.6 includes approximately 50 bug and regression fixes. As with 5.4.1, technical details about the release can be found in the change log. 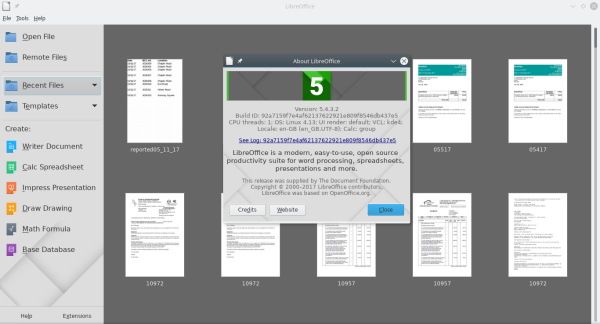 LibreOffice 5.4.1 and LibreOffice 5.3.6 are available for immediate download for GNU/Linux, Mac OSX and Windows. Select the version you desire for your preferred operating system. Please note that if you’re still using Windows XP or Windows Vista, LibreOffice 5.4 will be the last release that will run on those legacy operating systems. LibreOffice users, free software advocates and community members are invited to support The Document Foundation with a donation. Donations help TDF to maintain its infrastructure, share knowledge and organise events, such as this year’s LibreOffice Conference, which will be taking place in Rome in October.